The Armenian dram highlights the country’s ancient roots, but is affected by dynamic modern political and economic situation. A wide variety of currencies circulated in Armenia over the last few thousand years as different empires came and went. Silver coins called dram were first used in Armenia from 1199 to 1375, but the modern history of currency in Armenia begins in the early 20th century. After the region was ceded to Russia the First Transcaucasian ruble was introduced in 1918 when the country was part of the Transcaucasian Democratic Federative Republic which also included Georgia and Azerbaijan. The Transcaucasian ruble was on par with the Russian ruble, and contained Russian, Armenian, Azerbaijani, and Georgian text. The currency lasted only a year and was replaced at par by the Armenian ruble, Azerbaijani manat, and Georgian maneti. Like their predecessor, these currencies were also short lived, and eventually replaced by the Soviet ruble. After the fall of the Soviet Union, Armenia, Georgia, Kazakhstan, Moldova, Turkmenistan, and Uzbekistan tried to retain the new Russian ruble as a common currency. Unfortunately the volatile economic situation made the proposal all but impossible. The idea was finally abandoned when Russia unilaterally initiated a monetary reform policy which effectively forced out the remaining former Soviet states. 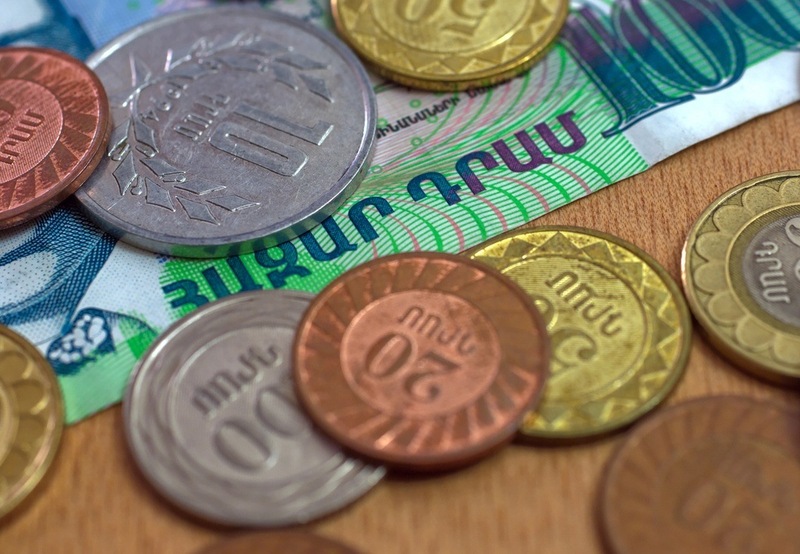 Armenia was one of the last former Soviet countries to create its own currency when it introduced the Armenian dram in 1993. The unique Armenian dram symbol was introduced in 1995. The symbol closely resembles in style the letters of the Armenian alphabet which was created by Mesrop Mashtots. The first record of the symbol appeared in the ledger of an Armenian start-up. The Nagorno-Karabakh dram was introduced in 2005 as the currency of the Nagorno-Karabakh Republic which is technically part of Azerbaijan but is home to ethnic Armenians. The Nagorno-Karabakh dram is valued on par with the Armenian dram, and despite the fact it is legal tender it is not as widely used. 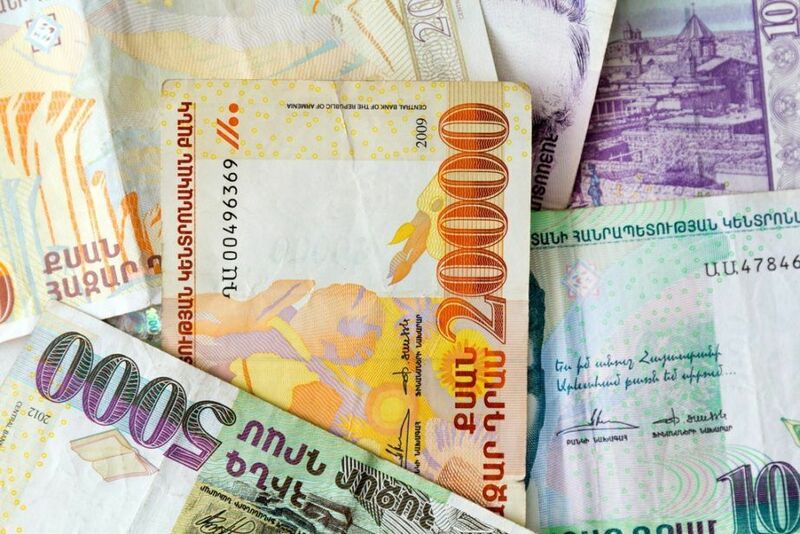 The Armenian dram was introduced at a rate of 200 rubles to 1 dram putting it at a value of 1 USD to 404 AMD. Over the last five years the value of the AMD has ranged between 0.002551 USD = 1 AMD to 0.002017 USD = 1 AMD. The first Armenian dram coins were introduced in 1994 in denominations of 10, 20, and 50 luma, and 1, 3, 5, and 10 dram. Officially all of the coins remain in circulation but today only the 10 dram coin remains widely used. All of the coins are minted from aluminium alloy, and feature the value and year of minting on the obverse, with the Armenian coat of arms on the reverse. New coins were released in 2003 and 2004 in denominations of 10, 20, 50, 100, 200, and 500 dram. The new release features coins minted from a variety of metals, giving each coin a unique colour. Like the original release all coins feature the value and year of minting on the obverse with the Armenian Coat of Arms on the reverse. The original banknotes, released in 1993 were pulled from circulation in 2005. The current banknotes were released in 1998. Under the Soviet Union, Armenia’s economy was based on large scale industry, primarily chemicals, electronics, machinery, synthetic rubber, and textiles, making it heavily reliant on importing resources. Today Armenia is heavily reliant on Russia for energy, and the Russian state has purchased many key assets in the country since 2000. The consequences of a devastating earthquake in 1988 are still present, and an uneasy ceasefire with Azerbaijan over the disputed Nagorno-Karabakh Republic has been in place since 1994. Armenia’s borders with Turkey and Azerbaijan remains closed making shipping goods by land difficult. After independence the country suffered a huge economic shock as GDP fell 60% between 1989 and 1992 and hyperinflation pounded the value of the dram. By 1995 however the country was back on track and posting strong growth. During the mid 2000s the country regularly posted double digit growth, until the 2009 recession caused a huge 14.1% contraction. Since then however growth has ranged between 2.2% and 7.2%. Like many former Soviet states the country is still working to liberalise the economy, and the country has received nearly $1 billion in international aid since 1993. Considering the circumstances the economy is well managed, but still suffers from a large trade imbalance which deflates the value of the dram. Remittances to Armenia have played an important role in economic growth, and in offsetting the trade imbalance. The imagery of the Armenian dram represents the country’s Orthodox Christian heritage, and the ancient history of the country. But modern border disputes with Turkey and Azerbaijan have made Armenia’s dependence on foreign goods more costly and contributed to a large trade imbalance which has depressed the value of the dram. Still, despite these issues and Russian influence on the energy sector, the country’s economy is well managed, liberalising, and has posted consistent growth with low inflation since independence. Learn much more about Armenia with our Country Profile and Travel Guide!